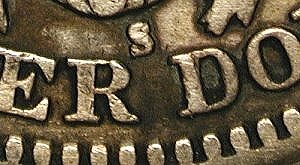 The 1901-S Barber Quarter is the key date of the set, and also the rarest 20th Century regular issue minor U.S. coin. It is very valuable in all grades, and fakes (mostly made by adding an "S" to a 1901) outnumber genuine specimens, especially in lower grades. To make matters worse, the coin's rarity makes people do some unwise things: someone who has looked for this coin for many years and finally finds one really wants to believe the coin is genuine and sometimes does not scrutinize it carefully. This has always been a bad idea, and impressive increases in value over the past few years makes the appearance of still more fakes a likely occurrence. Luckily, the 1901-S Barber Quarter is fairly straightforward to authenticate. 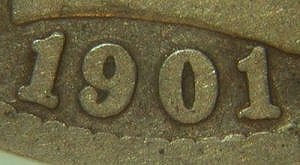 There were only two pairs of dies used to make this date, and they have specific date and mintmark positions. First of all, the date and mintmark must exactly match one of the die pairs exhibited in the following sets of photos. There are two sets of photos for both die pairs, representing higher grade and lower grade coins, as the devices tend to get "mushy" as the coins wear. There are also some other characteristics you can look for, and these are listed below as well. 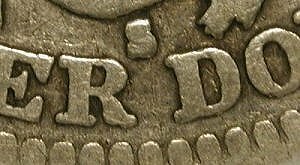 Obverse A: Both 1's are centered over a denticle, second 1 is close to the bust. Reverse A: S is somewhat tilted and closer to R than D. Note: A recently discovered 1901-P obverse die is a very close match to this die. Use careful attention when authenticating this coin. See "Sample fakes" below. 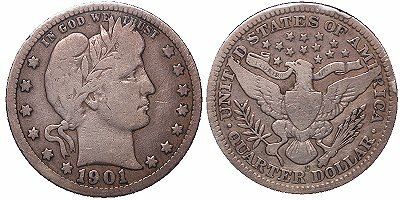 Die crack: In a late die state, Obverse Die A developed a die crack from the tip of the bust through the first star, ending at the second star. An example of a slightly earlier die state is seen with the crack only to the first star. 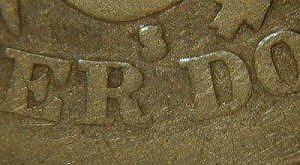 Only a small percentage of the Obverse A coins seem to have this die crack, but if a coin does possess this die crack, it is most decidedly genuine. The crack resides in a protected area, and has been seen in coins as low as the G/AG grade level. 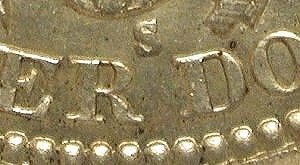 The BCCS would be interested to hear from anyone with a coin whose die crack is more advanced than the coin shown (via email address at the bottom of the page). Obverse B: Both 1's are centered over the left side of denticles, second 1 is not close to the bust (much lower than Die A). Reverse B: S is more upright and nearly centered between R than D. Note: Use extra caution here, as there is also at least one 1901-P date position that is close to the 1901-S Obverse Die B, although not exactly the same. Die cracks: Obverse Die B also developed die cracks late in its production run. In fact, a spectacular specimen was discovered with extensive cracks upwards in both directions from the date through all of the stars on both sides (!) -- the MS62 specimen pictured here presently appears to be unique. Only a single other example has been seen with cracks anywhere near as advanced (the MS67 specimen in the John Hugon Collection, sold for $150,000 in the 2005 FUN Heritage sale). However, a few low grade specimens have been seen with the beginning stages of the die cracks on the right side of the date. As with Die A above, the BCCS would like to hear from anyone with a late or terminal die state like described here. 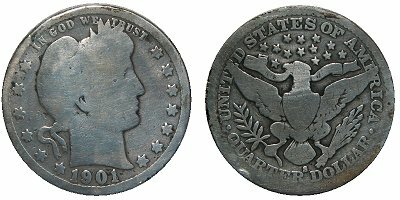 In addition to the mintmark position, scrutinize the mintmark itself -- it should match the rest of the coin. If the coin is a G or VG coin, the mintmark should not look like it belongs on an XF coin! Many fakes are like this. If the coin is a VG, then the mintmark should look like a VG. 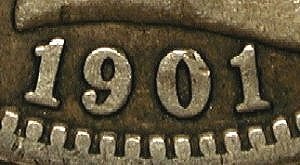 Unfortunately, one of the methods of authenticating the 1896-S cannot be used for the 1901-S. Beginning in 1900, the mints switched to the same types of collars, resulting in identical edge reeding. 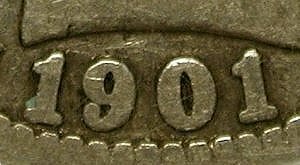 Thus, you cannot tell the 1901-S from the P and O coins by looking at the edge (like you can for the 1896-S). 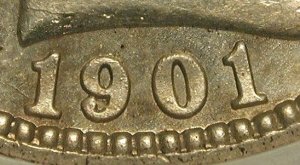 Another point: examine the edge of all 1901-S coins. 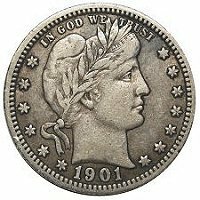 This writer has seen a fake that consisted of two halves of two different coins that were joined together: a 1901-P obverse married with an "S" reverse of another year. When the unsuspecting victim examined the mintmark, he did not see evidence of an added "S" so he thought he was safe. Nope, when the coin was removed from the 2x2, there was a nice seam around the reeded edge of the coin easily showing the fakery. The date position was wrong and would have easily given it away, if he had only known what to look for. See also article on Counterfeit 1901-S Barber Quarters. Here is a typical Added S fake. Note that while very close to obverse Die B, the position of the second 1 is slightly too high. The mintmark is all wrong and has the look of a much higher grade coin. A 1901-P obverse muled with a different-date "S" reverse. Note the mintmark is too low and too far left. There was also a seam around the edge where the two coin halves were joined. Recently discovered 1901-P obverse that closely resembles 1901-S Die A. This was made from a 1901-P die that closely resembles 1901-S Die A. Note that although both 1's are close to centered over denticles with the second 1 high and close to the bust, it is not an exact match. Compare to Die A above. Note that this coin has both 1's slightly left of being centered over denticles (the second more so than the first). Close, but not the same. Be cautious. It must match the genuine dies exactly!